Emily Hines, Taryn Hemmings, Leslie Osborne, Courtney Jones, Lindsay Tarpley. Tell us a bit about yourselves? I understand that you were all Athletes? YES! We all played soccer in college, and 4 of us are former professional athletes. This, of course, is where our Sweat inspiration came from. But Sweat has taken on a whole new meaning in our lives post-sports. We are now busy and hectic in a whole new way: running a company, striving to be the best, while balancing motherhood, home life, and social demands. Strong Women leading creating the Sweat Brand? How does this feel? I’ll be honest, we are really tough on ourselves. I always say this must be from our sports background and mentality. We try our best to take a step back and see all that we have accomplished, but I appreciate our team’s determination to be the best and never settle for low expectations. We have come a long way, and we have built something greater than we could have imagined. And with that, it feels damn good! It’s nice to see women work together and support each other, how did this partnership form? We get asked pretty often how we get 5 women to agree on something (sort of makes me laugh), but honestly, we work so well together because we were teammates, and we have taken that mentality into our business. We have seen each other at our best and at our worst. We have yelled at each other, gotten on each others nerves, but at the end of the day we are teammates. We need each other to succeed if we want to succeed as a whole. 6. All the ladies from the founding team played soccer. Did you ever play together? Does the company have a team? Everyone played with at least one other person on our founding team! Emily and Taryn founded the idea of Sweat when they played together at the University of Denver. Taryn went on to play professionally in Boston, where she shared the idea with her teammate, Leslie. The following year, I (Courtney) came along and was brought into it all! And the year after that, we brought Lindsay onboard, who had retired but was a former teammate of Leslie and Taryn. To put it simply, we are all in someway or another connected through the soccer world! 7. When you work out do you wear makeup? 8. What do you think of the expectations that women athletes should wear, makeup while male ones obviously do not? I actually feel there is less of an expectation for female athletes to wear makeup. I think female athletes are assumed to be “manly” or “too strong” or not feminine enough. You are seeing more female athletes wear makeup because of this stereotype. They want to show off their femininity in some way while competing at a high level! In general, I do believe there is an expectation for all women to look “presentable” all the time. Of course, this expectation was created by men LOL! Sweat in no way is telling women, “we must wear makeup while we workout”. But we created a “healthy”, cleaner cosmetic that allow women to feel confident, covered to their liking, and protected in an easy, convenient fashion. 9. Please tell us about Sweat Cosmetics? Where are you located? How long has the brand been around? Our HQ is in Denver, CO. A few of us work remote (I live in Texas). We launched our brand in the Summer of 2015, but had been quietly working on it since 2012. We pride ourselves on being the first beauty brand to solely dedicate themselves to cosmetics for an active lifestyle. 10. Your cosmetics are cruelty free, why do you feel this is so important? EXTREMELY important! If you can’t test your products on human skin, there is something wrong with the ingredients you have chosen. Our manufacturers share the same views and morals as us, and we have checked the full trail of our ingredients to make sure animal testing was never involved. 11. What are some of your favorite products? My go-to products every morning are our Foundation Powder Jar and our Mineral Illuminator. The Jar lets me build up coverage (I like a little heavier look), and the illuminator gives me the perfect glow on my cheekbones. At night, I couldn’t live without our Cleaning Towelettes. I always wipe my face clean with a towelette first, before using face wash. It’s my quick and easy way of “double cleansing”. Product Inspo: Daily life! With 5 female founders, all with an active background, we use our daily lives as product inspiration. What would make our lives easier? Inspiration in general: When you start a consumer goods company, your success is measured by the public. Our daily inspiration is our customers who remind us there is a need for active beauty! 13. Is there any obstacles you face having a guilt free brand? Animal testing for cosmetic use was recently banned in the EU. Realistically, at what point do you think a similar ban will be effective in the United States? My opinion, this will (and should!) happen sooner than later. The issue is not necessarily the animal testing in the US, it is where the US manufacturers are getting their products and ingredients. There is definitely a cost to having morals! The cheaper ingredients have been tested carelessly, and unfortunately, some US manufacturers still choose cheap over values. 14. We love that your products are Parabens and Silicone free, is this hard to do? And, what harm can happen from these chemicals? Me too :) It’s not hard to do when you take your time and do your research! Parabens are basically man-made preservatives. We chose to use a natural preservative instead because there is research about certain parabens messing with hormonal function and carcinogen capabilities. Silicone is great in some instances. The point of silicone is to form a protective layer that “locks in” moisture or prevents bacteria from getting in. 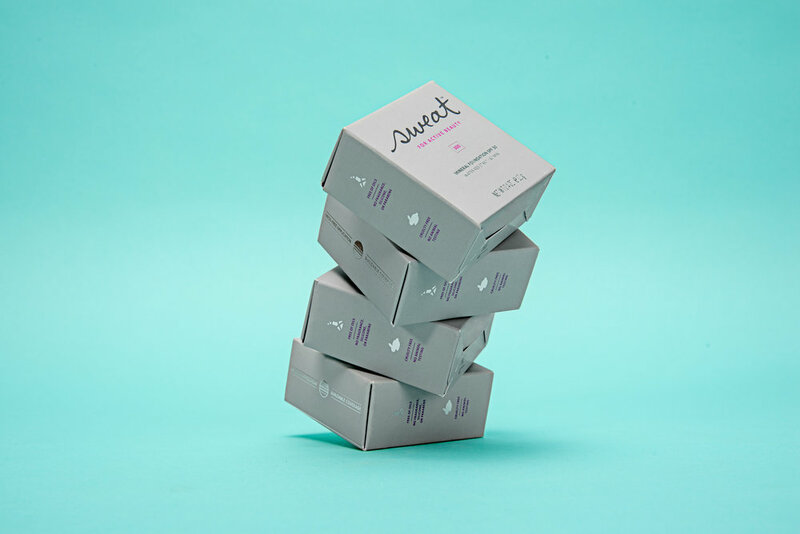 But since we are promoting women to sweat and be active with our cosmetics, we wanted to make sure sweat was not trapped under any sort of silicone layer. Without silicone, our product is more breathable and allows your skin to sweat without worry! 15. Are there steps to ban these chemicals in the US? I don’t think these ingredients will be banned. Silicone definitely won’t be banned. There are too many positive uses for silicone (burns, healing, etc.). As for parabens/ preservatives, there are some alternative options, but some are not as effective and are pricey in comparison. In order to create cost efficient products, manufacturers will continue using these ingredients. 16. We love your support with Breast Cancer, please tell us about that? When we started Sweat, we always knew we wanted to give back as much as we could. Being an female founded company, creating products for women, we felt there was no better cause to support. Since we are targeting 18-35 year old women, we chose to partner with Bright Pink, that focuses on education and prevention. 17. Are they any plans for the future? Absolutely! We want to continue to create essentials for women on the move. Over the past 3 years, we have worked on bringing awareness to the idea of active cosmetics. And now we will work harder on bringing more products to market.